"WASHINGTON, June 7, 2007 - The National Archives on Thursday unveiled a handwritten note by Abraham Lincoln exhorting his generals to pursue Robert E. Lee's army after the battle of Gettysburg, underscoring one of the great missed opportunities for an early end to the Civil War. 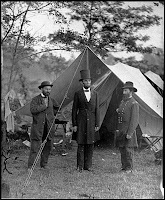 The text of Lincoln's note has been publicly known because the general to whom Lincoln addressed it telegraphed the contents verbatim to the front lines at Gettysburg. There, the Union army's leaders failed for more than a week to aggressively pursue Lee following his defeat." I know, it's somewhat nerdy of me, but don't we each have some unique interest that drives us? So there is mine, what a fantastic find! "The Lincoln Memorial Shrine is the only museum and archives dedicated to the study of Abraham Lincoln and the American Civil War west of the Mississippi River. Its extensive collection of manuscripts, diaries, images and artifacts is maintained by the Special Collections Division of Smiley Library." http://www.lincolnshrine.org/. super cool.... it's fun to be a nerd. cuz deep down inside we're all nerdy about something. speaking of which... can you find out the history of the word nerd?